I have a confession – I am not a cookie baker. Everyone tells me how easy they are to make, which might be true; they are easy enough to mix together… but then you have to bake them. They’re not like cakes, into which I can stick a skewer and check if it’s done. There’s no fail safe method (that I know of) to judge the perfect balance of done-ness, so that the biscuits will firm up as they cool, yet remain chewy without getting too dry. It’s IMPOSSIBLE, I tell you. I think I have managed it once in my life but only after baking three separate batches of the same chocolate chip cookie dough. I’d made Stephanie Alexander’s recipe gluten free, (drools) and was *this close* to giving up and just eating the raw cookie dough. I suppose, with practice, I could get it right consistently but then I’m sure I’d bake biscuits more often and that is something my waistline does not need. That being said, there are literally no low FODMAP biscuit/cookie options at our local supermarket. All the gluten free versions – maybe four or five brands – contain inulin, honey or agave syrup etc. I haven’t tested inulin out specifically but it’s generally in foods with other higher FODMAP ingredients, anyway, so it’s probably not much use. Besides, most of those packaged biscuits also contain a tonne of sugar and are ridiculously expensive, as well. Five dollars for a packet of gluten free biscuits that would cost no more than three dollars if they were made with wheat? No, thank you. I decided to try my hand at a healthier cookie recipe. I chose peanut butter and chocolate because, even though I can’t stand Reece’s Peanut Butter Cups, peanut butter and chocolate is an awesome flavour combination that I can’t get enough of, when done correctly. I’ll also kid myself that the choice of peanuts and almonds makes this “healthy” (combined, they’re low in sugar and high in copper, magnesium, manganese, niacin, phosphorous, riboflavin and vitamin E) and conveniently forget the maple syrup, which, although technically an unrefined sugar, is still a sugar. Shhh! Though, to be fair, I’ve used less than half of what might be found in your typical store-bought biscuit. No sugar-induced headaches here. 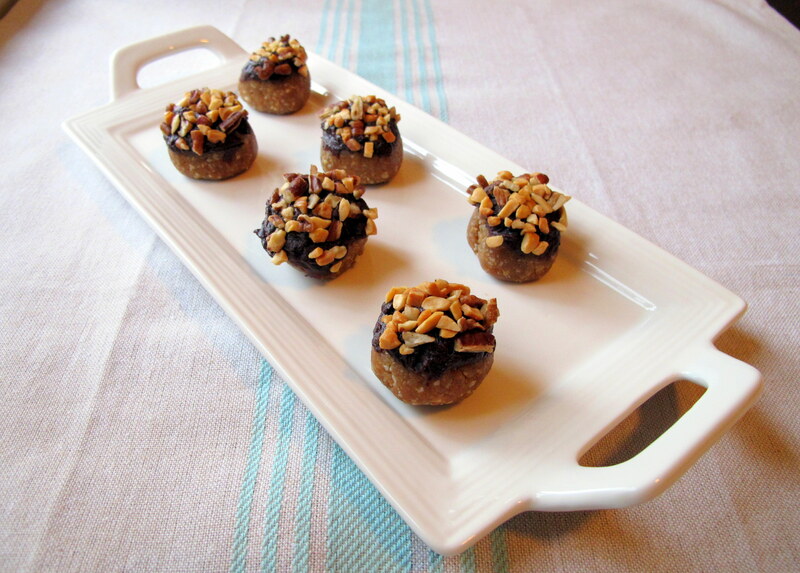 What resulted is a baked cookie ball that is delicately sweetened and peanut buttery, with a decadent fudge-like texture. The perfect after dinner treat with a cup of tea or coffee. Peanuts are a legume but are generally well tolerated, FODMAP-wise, in small (2 tbsp.) portions. Almonds are low FODMAP in servings of 10 nuts – stick to 1-2 of these balls and you should be fine. Maple syrup is low FODMAP, with a ratio of 1:1 fructose/glucose. Make sure you buy pure maple syrup, without any additives, to prevent sneaky sweeteners from getting in. Eggs are FODMAP friendly but can be an allergen/irritant in their own right. Pure vanilla extract is low FODMAP, check for additives. 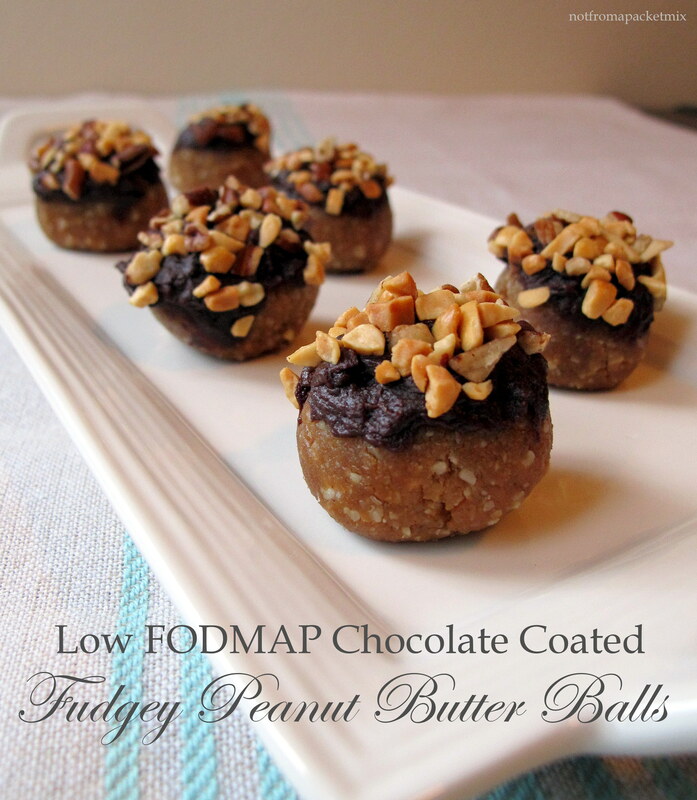 Dark chocolate is low FODMAP in servings of 30 g, see here. Makes approx. 26-30 balls, depending on size. In a bowl, beat the peanut butter, maple syrup, vanilla, table salt and egg until smooth, then add in the almond meal. 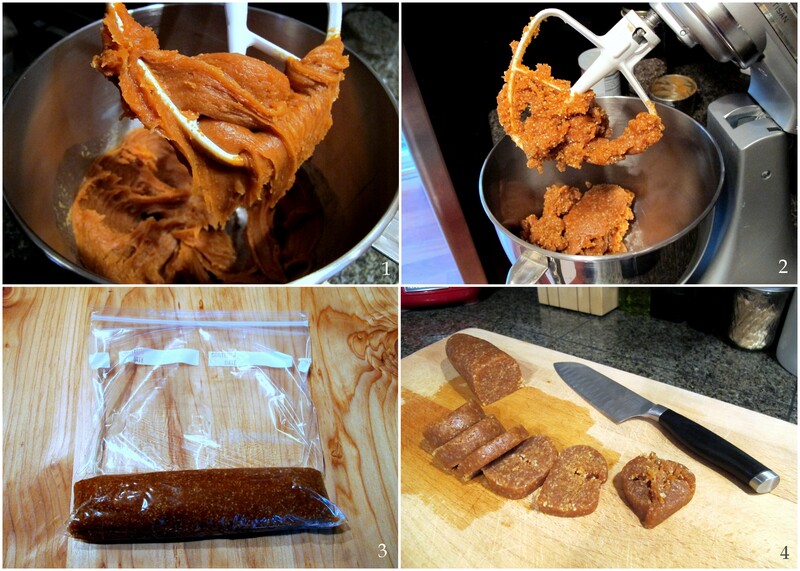 Mix until well combined and then cover and chill in the fridge for 10-15 minutes. During this time, preheat your oven to 150 C/300 F.
Place 1 tablespoon balls of the cookie dough about 2.5 cm/1 in apart on a lined baking tray; you could gently flatten them with a fork, making a crosshatch pattern if desired. 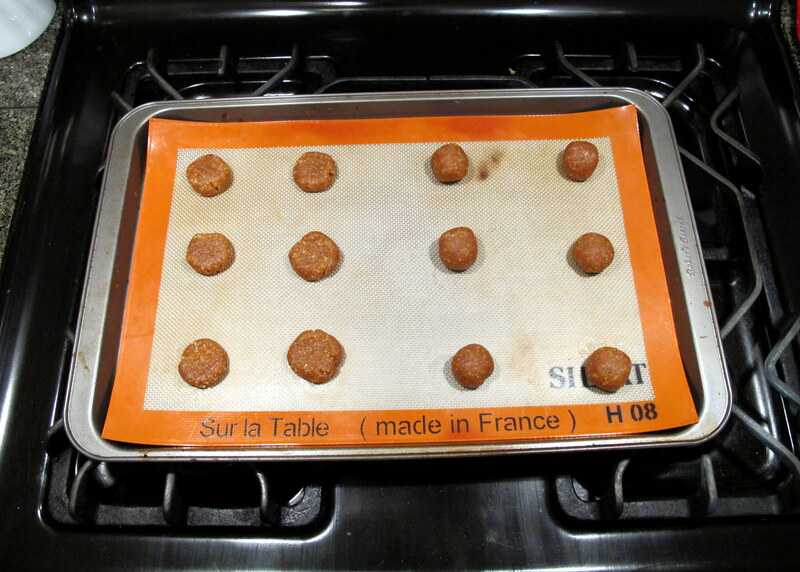 Bake for 10 minutes, swapping the trays halfway through, until golden brown at the edges. 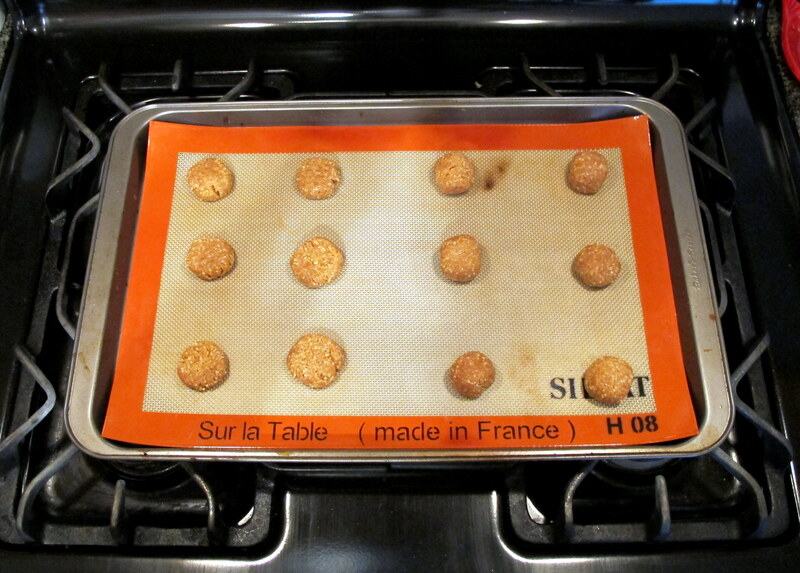 Let sit for a couple of minutes and then transfer to a cooling rack until they reach room temperature. Repeat with the remaining dough. As you can see below, I tested out both a flattened cookie shape and a ball shape and (obviously) decided that the balls were what looked best. 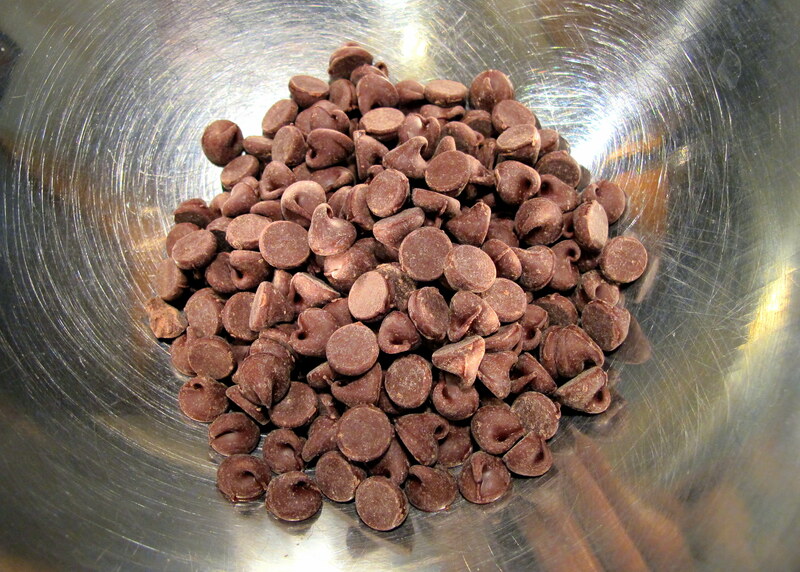 Let the cookie balls come to room temperature before melting dark chocolate (lactose/dairy free if required) using your preferred method (stove top double boiler, microwave etc), stirring until the chocolate is silky smooth. Fair warning, it is really easy to overheat and burn chocolate, so low and slow is the way to go. 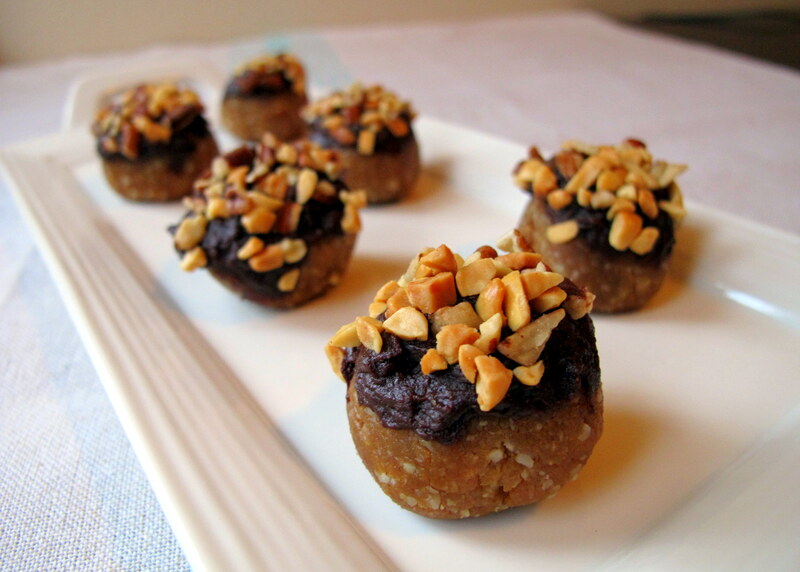 Dip the peanut butter balls halfway into the chocolate. Next, while the chocolate is still slightly soft (but not dripping), dip the coated part into a mixture of finely chopped nuts and leave to set on a baking tray. Store at room temperature in an airtight container for up to two weeks – if they last that long. Don’t forget to enjoy them with a nice hot cuppa. This entry was posted in Biscuits and Cookies, Sweets and Desserts and tagged balls, biscuits, chocolate, cookies, decadent, delicate, dessert, FODMAP, FODMAPS, fructose friendly, fructose malabsorption, fudge, fudgey, gluten free, healthy, home-cooked, homemade, low FODMAP, low sugar, maple syrup, nuts, peanut butter, peanuts, pecans, sweet, vegetarian. Bookmark the permalink.